Every once in a while, I get to do some graphic design. These are poster designs I did to advertise In The Current and Nourish, new conferences for international school counselors and to encourage well-being in the school community, respectively. 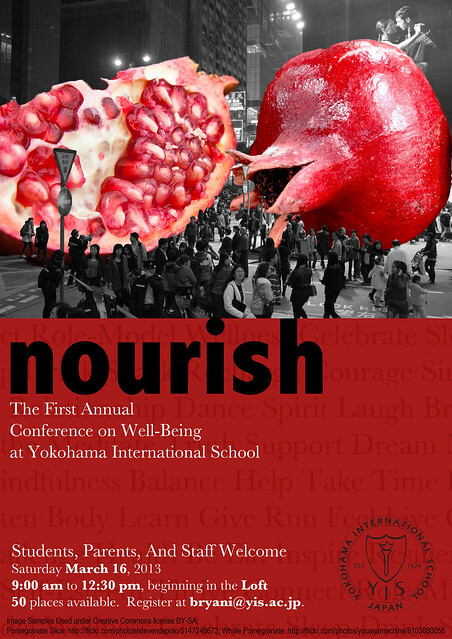 The pomegranates in the Nourish poster are not my photographs. I’ve used them under Creative Commons attribution and share-alike licenses. This entry was posted in Digital Collage, Media and tagged In The Current, International School, Nourish, Poster, School Counselors, Well-Being, YIS on February 25, 2013 by damienpitter.